If you are the parent of a transgender teen, this book will help you understand what your child is feeling and experiencing. Irwin Krieger is a clinical social worker with many years of experience helping transgender teens. This book brings you the insights gained from his work with these teenagers and their families. According to the author, "Today's teens have access to a wealth of information on the internet. Teenagers who are wondering about gender identity soon find out what it means to be transgender or transsexual. Parents, on the other hand, know little about this topic. When a teenager declares he or she is transgender, parents fear that their child is confused and is choosing a life fraught with danger. 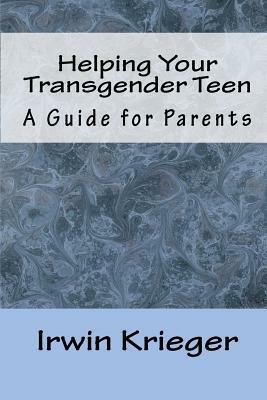 I wrote this book to help parents of transgender teens gain an understanding of this complex subject." "Helping Your Transgender Teen" begins with the basic information you and your family need. The central chapters of the book address the fears and concerns most parents of transgender teens share. The final chapters guide you through the steps you can take to discover what is best for your child. Although written for parents, this book is also useful for pediatricians, therapists, educators and others who work with teenagers and young adults. "Helping Your Transgender Teen" provides answers to many of your questions about adolescent gender identity. Irwin Krieger is a clinical social worker in private practice in New Haven, CT. He has been providing psychotherapy for the lesbian, gay, bisexual and transgender community for over 25 years. Since 2003 he has been working extensively with transgender teens and their parents. "Helping Your Transgender Teen" brings you the insights gained from his work with these teenagers and their families.